After spending quite a while trying to work out what I wanted to embroider for the three Beyond TAST embroidery challenges that I was behind in, I attacked the stitching like a mad woman and am really happy with the results! I’ll show them in the order that I embroidered them rather than the challenge order. First up is season 8, my woven stitches sampler. 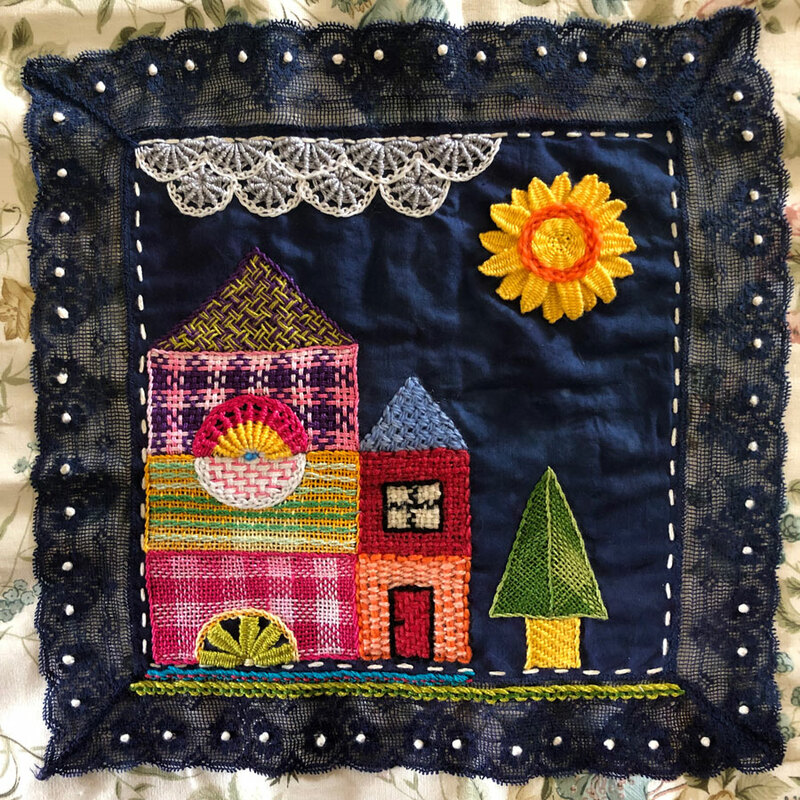 First I stitched a vintage handkerchief that I had dyed navy blue to a background piece of cotton with running stitch and caught down the lace with a French knot in each scallop. I then drew a picture of some houses and a tree inspired by vintage wooden building blocks. The sun is a woven wheel surrounded by open based needlewoven picots, with pekinese stitch surrounding the woven wheel. The top arch in the house on the left is whipped wheel, again with a pekinese stitch border. On the very bottom arch I wove the spokes two at a time. The clouds are also whipped wheel with a pekinese stitch border around each “puff”. The main parts of the sampler are all woven with stitches from “Needle Weaving Techniques for Hand Embroidery by Hazel Blomkamp. I worked the house on the left and the tree with perle cottons, while the smaller house is crewel wool. I love woven stitches, especially over large spaces. They are fun to work, but I also love the way they look. Trust my intuition. On the sun, I almost did one layer of picots and no border around the centre. I trusted my intuition that it wasn’t finished, and was really happy that I added more. After all, it’s embroidery, and if I didn’t like the extra work I could always cut it out. Blocks of weaving and woven wheels look great with another stitch as a border around them, especially if you’re using them as a filling over a fairly large area. Next up I’ll tell you about challenge 6, laced and threaded stitches. Because I just hate to do anything in the expected order, apparently. Previous Previous post: Some Christmas Favourites!